Our Cover to Cover Book of the Month for February is Flora and the Peacocks by Molly Idle. Let the beautiful illustrations guide you through Flora’s journey in creating a beautiful new friendship. 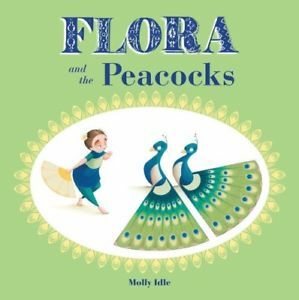 Celebrate diversity with Flora and the Peacock by Moly Idle!Flora may not have much in common with a Peacock, but that isn’t going to stop her from dancing a beautiful friendship dance with them. While reading, talk to your child about the challenges that Flora faces in her attempts to connect with the Peacocks. Promote problem solving skills and explore with your child the many ways in which a person can overcome differences. Flora and the Peacocks is a wordless book! This is a beautiful opportunity to aid in the development of your child’s vocabulary and comprehension skills. While reading, focus on the illustrations to guide the conversation. Noticing and talking about the details of each illustration will have you using lots of language with your little one and also help her figure out the story. Play that encourages cooperation is a great way to promote skills to build strong relationships! Play blocks with your child to promote cooperation. Creating a plan together, taking turns, and sharing will encourage cooperation and create a fun interactive experience. Try building with everyday items such as egg cartons, shoe boxes or food boxes! A pre-cursor to letter recognition is shape identification. So, try pointing out the shapes of the blocks as you play! Send a picture of you and your child playing with blocks. Be creative! We can’t wait to see what you loved about Flora and the Peacocks!